I couldn’t help pulling out my camera. It’s a little Canon point-and-shoot, maybe just a notch above an iPhone in ability, and it doesn’t much like low light conditions. 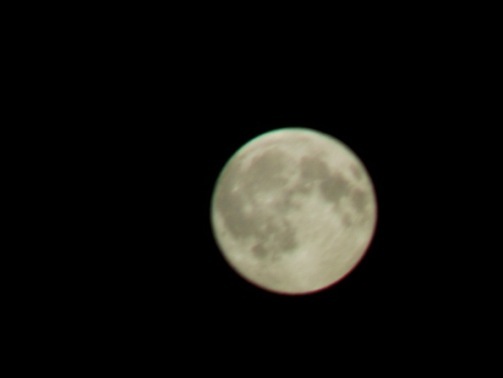 In fact, my late lamented Nikon Coolpix did a better job with moon pictures. Like this one, from April 2010. I even learned to get full-moon pictures with that (point it at the moon, make sure there’s nothing else in the field, and – for some reason – set it to flash). This camera doesn’t do it. Here’s what I got tonight. It was the more galling because binoculars that show the moon beautifully, down to the Mare Imbrium and the Crater Copernicus. So it was frustrating not to even get the markings one sees with the naked eye. Until I tried taking a photograph through the binoculars. I lined up the camera lens and the eyepiece (which matched pretty well in size), focused and clicked. Here it is – not a sharp brilliant shot like those on Flickr, but probably the best moon picture I’ve gotten so far. I’m pleased. I think it’s okay for a PAS camera without an actual telephoto lens. Well, well done. I think it’s a *lovely* PAS photo. Congratulations. 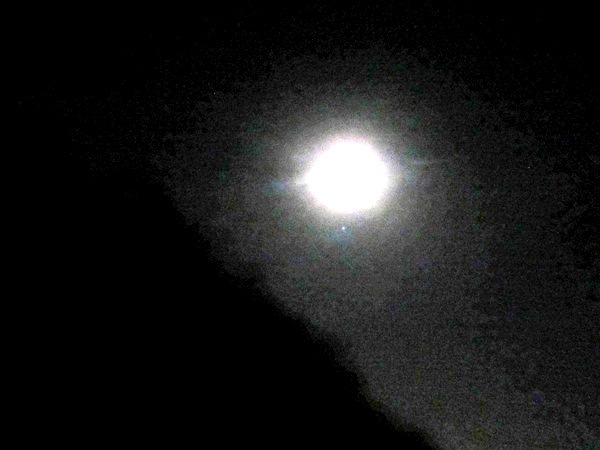 And, if you look really, really closely, you can see The Man in The Moon winking, right at *you. * Thanks for yet another great, informative post.